MAN manufacturing plant in Turkey. Man Truck and Bus, one of the leading suppliers of commercial vehicles and transport solutions worldwide, has unveiled its latest generation of buses and coaches to the Middle East market. Among the highlights for the region is the MAN Lion’s Coach, now also available in the Middle East with Euro 5 fuel quality. It complies with the EEV (enhanced environment-friendly vehicle) standard and operates without the necessity to use fuel additives like AdBlue. MAN showcased this series recently for its regional customer base at BusDays held in Ankara, Turkey. 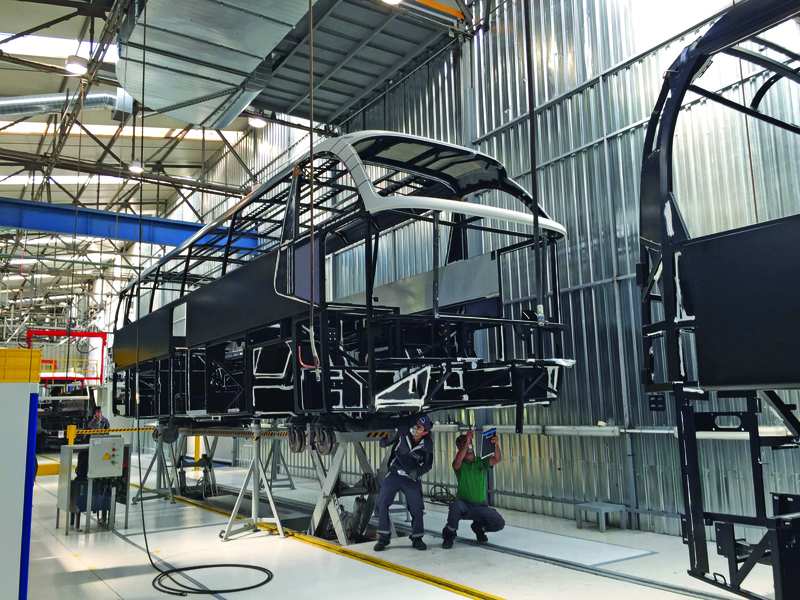 Organised at the company’s bus manufacturing plant in Turkey, the event aimed to reinforce its leadership position in urban and long-distance public transport. MAN’s versatile Lion’s City bus portfolio was also on display at the event, in addition to various chassis options to cover individual customer requirements. “The BusDays Ankara event is an important platform for MAN to showcase our innovative product range,” said Franz von Redwitz, managing director of MAN Truck and Bus Middle East. Last year was a very successful one for the company compared to 2013. In the UAE alone, the company witnessed 35 per cent growth in volumes. Having worked with the MAN Group for over 16 years, von Redwitz was appointed managing director of MAN Truck and Bus Middle East in March this year. He has handled a variety of international bus and coach sales management roles, including working with the Middle East in the past especially in the UAE where he played a leading role delivering 400 buses to Dubai’s Road and Transport Authority (RTA) in 2008. His last position was head of product marketing, bus and coach for MAN Truck and Bus in the headquarters in Munich, Germany. In this role he was managing the development of the MAN Lion’s City GL CNG bus, which was awarded bus of the year 2015. On his new role, he said his focus would be on customer orientation, delivering world-class after-sales services, and technology development to maintain the company’s leadership in the Middle East commercial vehicles market. In addition to the RTA, the company has also supplied more than 400 buses to the Department of Transport Abu Dhabi. The company has recently received an order for 127 buses from the Ministry of Transportation in Bahrain, which involves the provision of 88 midi-buses and 39 MAN Lion’s City vehicles. The buses are low entry city bus chassis which have been equipped with customised Caetano bodies to navigate through narrow streets with a high number of passengers at the same time. It is also negotiating another bus deal with a Gulf country. The MAN Lion’s Coach has a special air-conditioning and isolation package for very hot climates and offers highly efficient cooling even in the hottest areas like the Gulf countries. The coach offers high comfort for long distance travel and comes with sufficient luggage space of 10 to 11.5 sq m.
Like all MAN buses and coaches, the Lion’s Coach has been thoroughly tested for its aerodynamic performance, noise reduction, climate channel and impact resistance. The coach will be seen in a roadshow in the region in a few months. In the city bus segment, MAN showcased its flagship the MAN Lion’s City and the portfolio that covers the transport requirements of different cities. MAN already has mature, sustainable, carbon-dioxide (CO2)-efficient and economical future technologies as standard features in a wide range of CNG buses. This is also reflected in the fleet of EGO, a local bus operator in Ankara. The MAN component of the EGO fleet is 77 per cent, and 74 per cent of the vehicles are CNG buses – all of them from MAN. This equates to 1,300 MAN CNG buses used for the city of Ankara – the largest CNG fleet in the world, said von Redwitz. Beside the buses, MAN also offers chassis solutions for Middle East customers and provides a range of smaller sized midi-buses, city buses and coaches together with selected body builders to meet different customer requirements. The coach chassis are optionally equipped with ACC (adaptive cruise control) which is a USP (unique selling point) in this segment. Ankara, where the BusDays event was held, is the main production site for coaches and intercity buses of the MAN and NEOPLAN brands. It is MAN’s largest bus plant (320,000 sq m) with 1,600 employees. Seven vehicles are manufactured per day on one production line at the Ankara plant. Among the key operational steps are the welded skeleton (shell) which is precision-measured by laser before being given coatings at the CDP (cathode dip painting) unit giving them protection against corrosion. The CDP unit at the Ankara plant is the most advanced of all of MAN’s plants.